Durable and comfortable with a high-quality leather construction, the Briers Checked Leather Gardening Gloves B7657 are ideal for protecting your hands while gardening. With 100% leather palms, they are ideal for improving safety for hands during tough gardening tasks, while the ergonomic keystone thumb design allows for easier and more comfortable movement. The product code for the gloves is: B7657. The Checked Leather Gardening Gloves protect hands from dirt while working with soil and plants. With leather palms, they are ideal for tougher gardening tasks that involve handling coarse branches, stems, and plants. The keystone thumb is one of the most comfortable and ergonomic designs when it comes to safety gloves. It improves ease of movement, which in turns makes handling safer and more efficient. 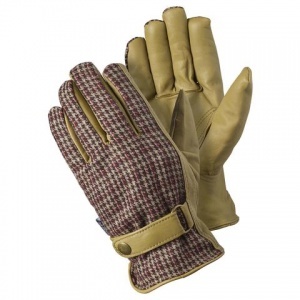 The Briers Checked Leather Gardening Gloves B7657 are available in a single size that should be suitable for most users. Please consult the table below for details.